For many seniors with cognitive issues, the idea of going back to school might seem daunting, or even impossible. But at SunTree Center, 4120 N. 20th St., a new program has launched that keeps seniors mentally active and engaged. 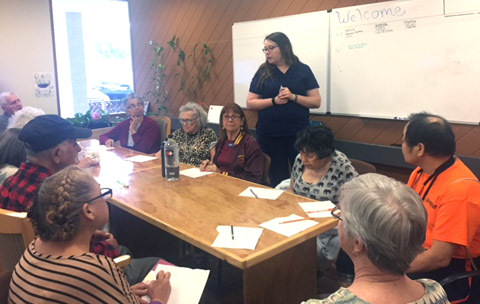 Ashley Shoup, a staff member at SunTree Center and nursing student at Phoenix College, leads a class during School for Seniors (photo courtesy of SunTree Center/School for Seniors). Van Nguyen, program director at SunTree, developed the School for Seniors curriculum which she says follow three fundamental concepts: Purpose, Engagement and Socialization (PES). Those who are already members of the center’s Adult Day Program can take School for Seniors at no additional charge. The next session begins on Monday, Oct. 15. New members are welcome to enroll in the center and take advantages of the School for Seniors classes. The 12-week curriculum may include courses incorporating dance or music, storytelling and other topics that touch on the participants’ emotional, cognitive and physical health. “School for Seniors is about stimulating what was once learned and what was once everyday knowledge. It is about stimulating the senses, reactivating parts of the brain and the memories—remembering one’s history,” Nguyen explains. Some classes are taught by SunTree staff members, while others are taught by Valley nursing students. The seniors scholars not only benefit from these courses that can tap into their long-term memories, but also benefit from being with others through socialization, peer support, and emotional connectivity. “They are excited to be students again, and it helps preserve their dignity and elevates their quality of life,” Nguyen says. For more information, visit www.suntreecenter.com or call 602-441-4900.